Way too much money that I don't really have was spent on food this weekend. But I'm thankful to be out of scholarary confinement so I can actually enjoy having meals with friends again. Just need to limit myself. Momofuku has certainly made a name for itself these days. I've been lucky enough to have had the bo saam at the Momofuku Saam Bar a couple years back so I was happy when Saki invited me to yet another of their culinary experiences that requires a reservation. 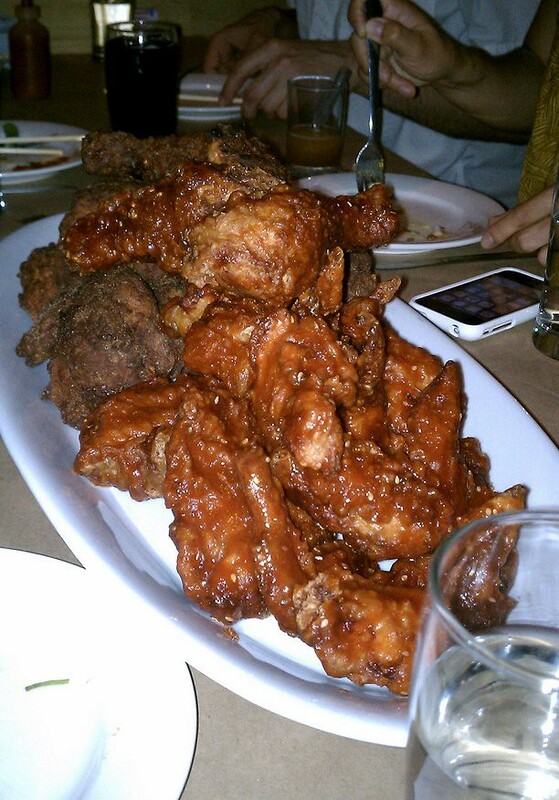 This time it was the fried chicken, half Southern style and half Korean style. The later wasn't quite as spicy as some of my fellow diners would have liked but it worked for me. I actually like the flavors better then the buttermilk and the way it was fried reminded me of the Chinese fried chicken drumlets I had when I was younger. The ones where they push the meat up forming a drumlet popsicle. Can't beat the convenience of the built in handle! Anyhow, I was completely amazed at how moist the white meat was. It was moistest white meat I think I've ever had. The mu shu pancakes, I could've done without. They were much too tough and dry. I ended up tearing off bits of it to use as my own personal sauce trays for the four different sauces. Eric snapped a picture so hopefully he'll put it up somewhere. Wasn't sure what to do with the carrots and radishes so I munched on them between bites of chicken. A few of us indulged in the ultimate... lettuce wraps filled with fried chicken skin. So good but oh so bad. Don't like the flash but was too excited to eat to bother retaking this shot. We also had the bok choy, fingerling potatoes, and snap peas. The first two were my favorites. The bok choy with a savory pork broth and cipollini and the potatoes with bacon, poached egg and scallions... mmm. Can't go wrong with bacon. Having said all that though, I still think the bo saam is the better dish. Tender pork you can pull off the bone topped with raw oyster and a variety of sauces... mmm. I'll definitely go back for that again. I'm sure I can find 7-9 others who will want to partake in the porky goodness.